Well Loyal Legionnaires, I was wanting to post this in a finished state, but it just didn't make the grade yet. 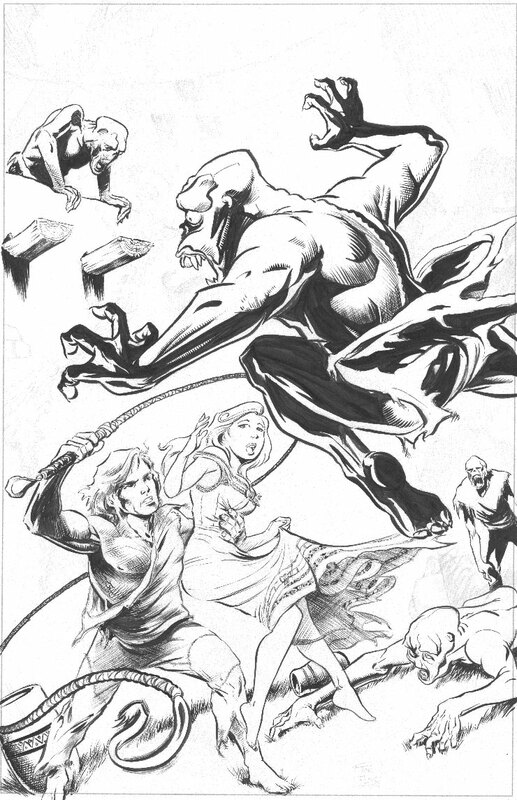 But here are the inks progressing. I really have most of it finished, just need to put the jungle, the vines on the adobe walls and fix a couple of areas. Which will have to wait for a few more days. My hand just won't take anymore this weekend. 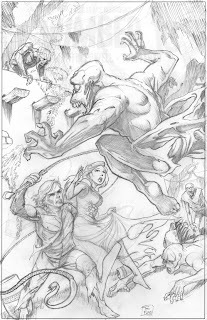 Just six months ago, I could have inked this piece in a day. This is close to two days work and looking at another one for the background. I really hate this stuff that is attacking me. It is getting worse all the time. So anyway that is about it Legionnaires, I am sorry I wanted to post some Captain Spectre stuff, but nothing new has happened. That is nothing new in the art area. Even tho this stuff is slowing down my hands, it hasn't taken over my mind. So I am learning more about writing all the time. Hopefully all this behind the scenes work that I really can't show will improve the stories greatly. I can only hope. It is a complex thing to design and trim a story to get it into a comic. I think short story or novel might be easier. More room to get the points across. The comics have to be lean and mean, trimmed down to get you to want to turn the page. Well folks, and of course Loyal Legionnaires from all over, it seems I just can't keep up. I have a couple of additions to throw at you so here goes. 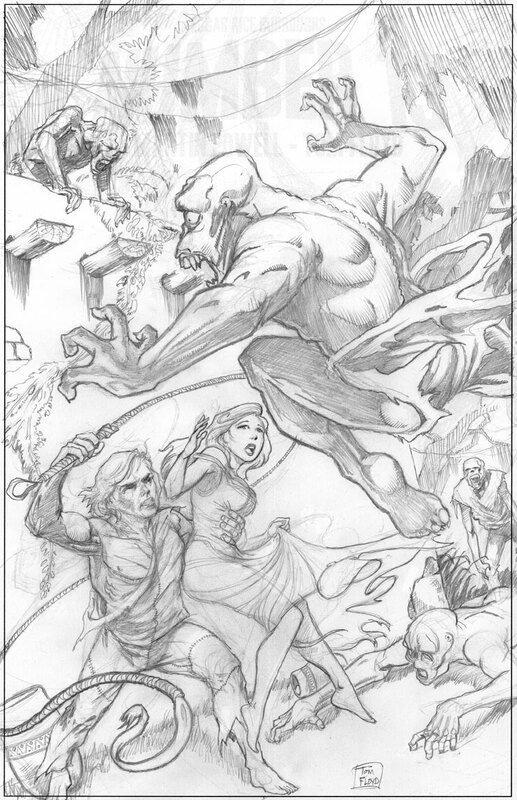 The first are the finished pencils for a piece produced for the project 'Number 13'. An ERBurroughs adventure published in 1913, adapted by Martin Powell. Number 13 is the original name of 'the Monster men'. We are going to use the original tales' name to try to keep things straight. 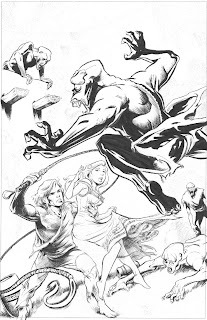 This is a piece that I roughed out, sized up in photoshop and fixed a couple of things, then lightly printed out onto board, then I finished the pencils on the printed board. It is a great way to get things composed and organized on the page before committing to highly finished pencils or even inks. The second piece is the finished cover design to 'PreFlight' which is taking over, kind of cutting in line in front of the promised 'Solo Flight' issue of Captain Spectre. Again the reason for this juggling of issues is that 'PreFlight' will be a short tale, and easier for me to get to. 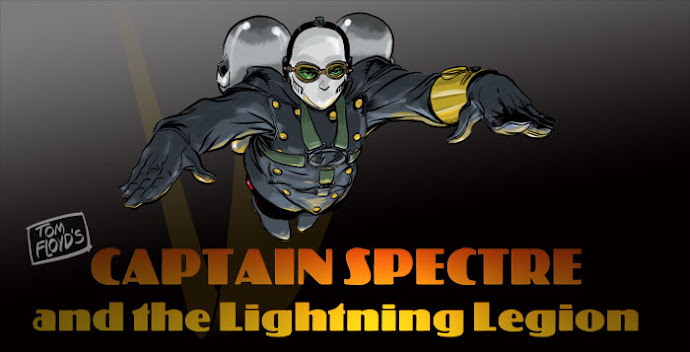 It will be an introductory tale to Captain Spectre....kind of setting the stage. But it isn't an origin story. 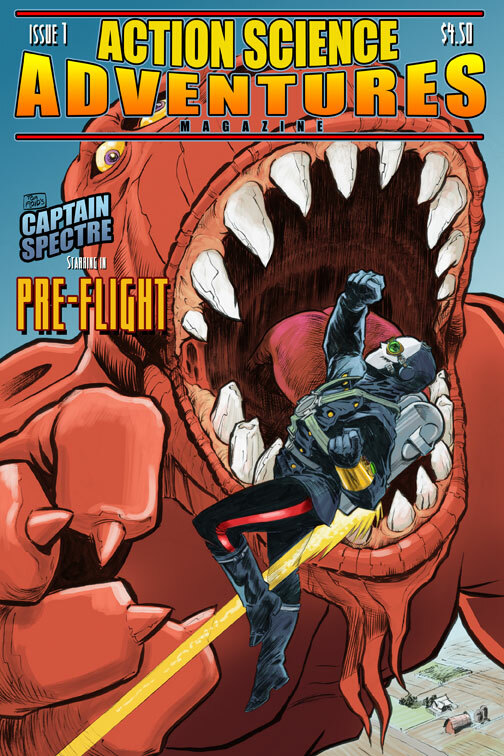 It will have a taste of an origin to let new readers know who, what, why, and all that of the Captain Spectre story. But nothing long and drawn out. I have posted this before, but it didn't have the cover treatment done to it. And if you want to know a bit more I will post this below the actual good stuff up top. The reason I haven't posted much, is I haven't been able to get much done. I have had many bad days lately and things just aren't moving along at a decent pace. I hate it, and I hate even writing about it. I feel like I am whining, and have never been know to whine much about myself, just about my day job and stupid things. ha. Anyway I will continue to post the medical stuff below the art so as you Loyal Legionnaires pass over the art, you can ignore the last paragraph of my posts. Here's to better days and more art which leads to more posts.